If you’re reading this, you already understand the cost in time, money and the emotional stress when your basement floods. With that in mind, let’s not waste another second of your time. Here are 5 hard facts about sump pump system failures. There are over a dozen reasons why a sump pump system can and will fail that DO NOT include the pump motor. Beacon ProAct® 200 is the ONLY technology that tests your sump pump system under real-world conditions automatically and on-demand. Do Your Test Your Sump Pump? Do you test your sump pump regularly? If not, don’t feel bad. Most homeowners don’t test their sump pumps even though nearly all the best sump pump manufacturers, like Zoeller®, recommend regular testing. And it’s not difficult to understand why. Who wants to go down to the basement, lugging a five gallon pail of water to fill a dirty, bug-ridden sump pit? In most homes, the task of clearing the cobwebs, removing a dirty sump cover and peering into a dark cavity beneath the basement floor is just too much. As a result, the sump pump is never tested and likely not maintained as the manufacturer recommends. How realistic is it that someone in your household will remember and have the time to regularly test your sump pump system? Why is Sump Pump Testing So Important? At the heart of every sump pump system is the motorized pump. If it fails, you’re in real trouble. But did you know that there are many reasons that even if your pump motor is running that it might not be pumping water? 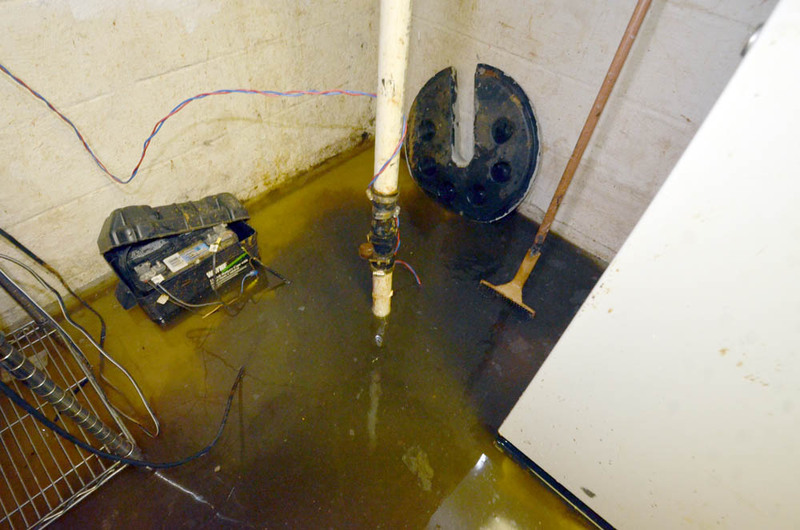 Here are just a few causes of basement flooding that aren’t related to the sump motor working. In each of these cases, you’d hear the pump motor turn on, but the amount of water being pumped out of your basement or crawl space could be greatly diminished or even none at all. Testing your entire sump system by filling the sump pit with water and measuring the water being expelled by the pump is your best guarantee that the sump pump will work when the rains come. Owning a Sump Pump Alarm is NOT Enough. There are products that alert you when water is rising too high in the sump pit. (You can read about sump alarms here.) The problem is, by the time you receive the alert, it’s likely too late! The water is rising and your pump isn’t working! Testing your pump on a regular basis is the only way to ensure that when you need the sump pump to work, it will work! That’s what the ProAct® 200 does. It tests your sump pump and critical components once a week so that when the rains come you know your home is protected. Your Sump Pump IS Emergency Equipment. At Beacon, we consider your sump pump an emergency piece of equipment. It’s as important as a whole-home generator, a smoke and carbon monoxide alarm, or a fire extinguisher. When water starts to infiltrate your home, that’s an emergency. Your sump pump has to work! When you think of emergency equipment, like fire and safety equipment, it is always tested at regular intervals. Most pieces of emergency equipment have a built-in self-test capability. The ProAct200 makes your sump pump, a critical piece of YOUR emergency equipment, self-testing. While there’s no question that new pumps are much more reliable than older pumps, sump system failures still occur. The result, whether a new or old pump, is the same. Water in your basement that leaves thousands of dollars in damage, the loss of prized possessions, and the moldy cleanup that inevitably follows. At Beacon, we believe that a good primary sump pump is at the heart of any system meant to keep water from flooding your basement. However, a brand new sump pump will be of little help if your discharge tube is blocked, your float switch disabled by a toy thrown in the sump pit, or if the circuit breaker supplying the pump with powers was somehow tripped. The Beacon ProAct® 200 can alert you to these and other critical system problems that could disable the ability of even the best, newest pumps to keep your basement dry. Here are just a few of the emergency situations that the ProAct® 200 can alert you to. The BEACON® ProAct® 200 is the only sump pump alarm and monitoring system that tests the entire installation under actual use conditions by delivering fresh water into the sump pit. to talk to our experts!